Brazilian rubber tapper and land rights leader Chico Mendes pioneered the world's first tropical forest conservation initiative advanced by forest peoples themselves. His work led to the establishment of Brazil's extractive reserves protected forest areas that are inhabited and managed by local communities. Chico Mendes and his colleagues were a tiny, marginalized minority in the 1980s, but their efforts brought them to power in parts of Brazil's Amazon by the end of that decade. Tragically, Mendes became world-famous only when he was gunned down for his work in 1988. EDF's Steve Schwartzman, an early ally of Mendes and a long-time participant in the Amazon land rights struggle, continues working on national and international policies to help bring Mendes' vision of independence for forest peoples and forest reserves to fruition. 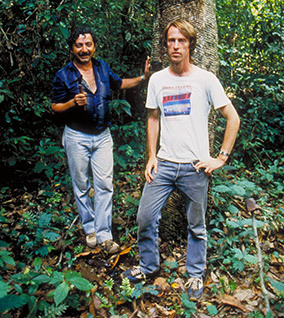 In the 1970's and early 1980's, Environmental Defense Fund anthropologist Dr. Stephan Schwartzman worked closely with Chico Mendes researching and advocating the extractive reserves idea. In 1987, Schwartzman and Environmental Defense Fund invited Chico to attend the Inter-American development bank (IDB) annual meeting. He was introduced to influential members of the Administration and Congress. Schwartzman worked closely with Brazilian environmental and indigenous peoples' organizations and community groups to change or halt the most destructive multilateral development bank's (MDB's) projects and to advance locally supported sustainable alternatives. In October, 1987, Schwartzman met with the governor of the Amazonian state of Acre, Brazil, to discuss the work of Environmental Defense Fund with the multilateral development banks and Schwartzman's research on the rubber tappers' sustainable alternative proposal. Schwartzman participated as an observer in the negotiations between the government, Chico, and other rubber tapper leaders. The first extractive reserve negotiated was a 40,000-square-hectare forest area in the Seringal São Luis de Remanso. Environmental Defense Fund helped focus attention on the escape of Chico Mendes' murderers by delivering over 4,000 letters from Environmental Defense members to Brazilian President Fernando Henrique Cardoso. The letters requested a full investigation of the escape. Environmental Defense Fund provides technical and advocacy skills that are essential for effective environmental action in Brazil. Schwartzman has won international support for reserves, including high-level endorsement by the World Bank and Inter-American Development Bank (IDB). Environmental Defense Fund and Schwartzman continue to work with Brazilian partners and Indigenous communities to preserve and protect tropical forests. EDF's Stephan Schwartzman (right) recalls Mendes (left) 20 years later. Analysts agree that the planet is losing forest cover. We're working to develop solutions.